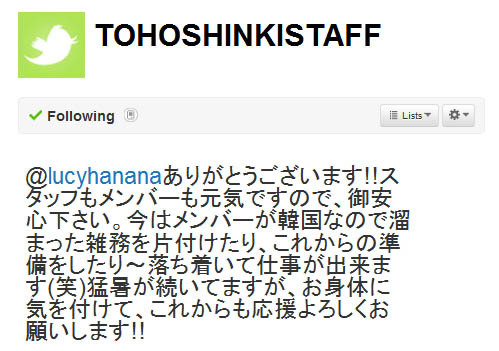 @TOHOSHINKISTAFF You’ve worked hard! The weather continues to be hot everyday, is everyone okay? While supporting the members, and worrying, I am thinking about all the staff as well! Please overcome this hot weather without falling sick (^^) Tohoshinki Team, Fighting!! All expected to be release on Sept 8th. 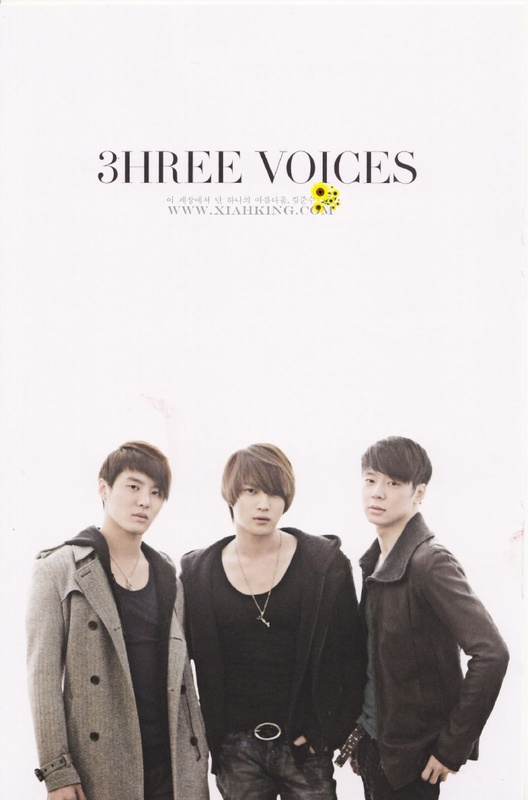 And they are ready for preorder on Yesasia. The title is has yet to be decided. And it is a mini-album. 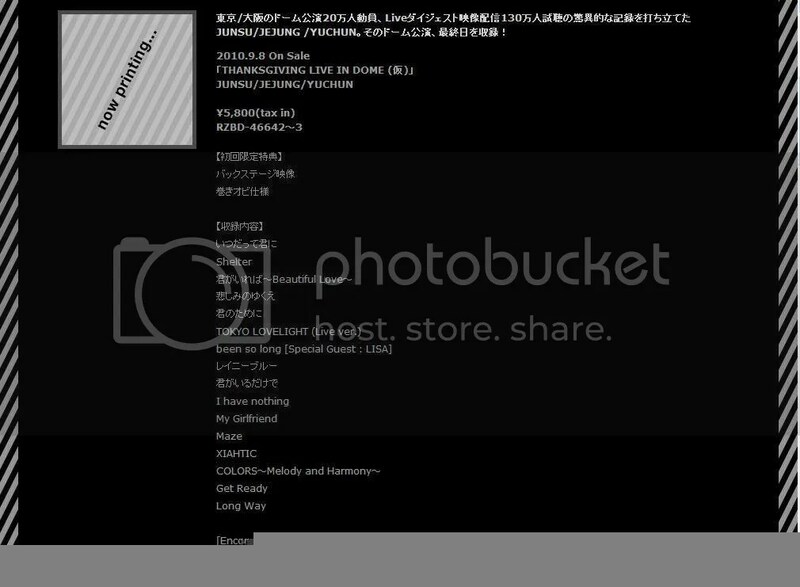 There are no words from AVEX official in regards on when and which company will be distributing the worldwide album. SBS E! News Korea Star Q10’s summer series ‘Summer Special – Promoting Korean Idol Groups’ will show the many idol groups that have succeeded in the Japanese entertainment Industry. Today in Japan, there is a saying, ‘The entertainment industry cannot survive without idol groups’ that shows the idol groups’ high level of activity. Within these idol groups, there is one that has high popularity in Korea and has achieved great success in Japan; they are TVXQ. TVXQ, who were not able to appear in TV shows due to the language barrier when they first arrived in Japan, started little by little on local channels. 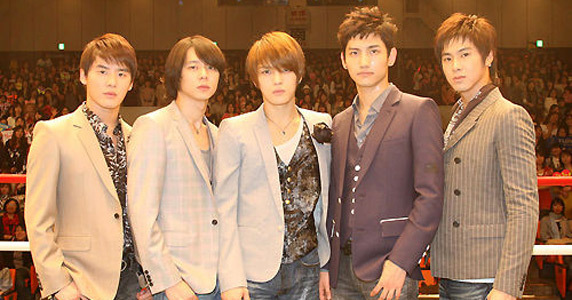 Now they are able to perform and act in popular programs in Japan, showing more of their charm. This episode will air on the 14th. Note: Probably on August? Tohoshinki’s Yunho takes the leading role of the drama for the first time! The youth love comedy, in which Yunho attractively performs a soccer player who targets the world, “No Limit ~Heading To The Ground~” will be broadcasted on DATV! And, just before the broadcast, we will send you the special interview, which is a close up of Yunho’s real face! If you do not understand the feelings of the other person, I think it is difficult to perform the role. “No Limit ~Heading To The Ground~”, don’t miss it! JUNSU/JEJUNG/YUCHUN has made a tremendous record, attendance of 200000 in dome concerts of Tokyo/Osaka and live digest video access of 1300000. The dome concert of the last day is recorded! JUNSU/JEJUNG/YUCHUN has made a tremendous record, attendance of 200000 in dome concerts of Tokyo/Osaka and live digest video delivery access of 1300000. They will start their Japanese activities by this mini album, which includes the 4 new songs that were first introduced at the dome concert! “Pushed her shoulder” vs “Slapped her face” What is the Truth? Both sides refuse to back down in the ‘assault dispute’ case surrounding the manager of singer and actor Micky Yoochun. On the information sharing site ‘Nate Pann’, a netizen wrote on the 26th that Micky Yoochun’s manager assaulted her younger sister and swore profusely at the siblings. The netizen stated that she and her sister met Micky Yoochun by chance at a restaurant and explained that they got in a dispute with his manager, who was acting very hostile. According to the netizen, the manager swore at her younger sister, pushed her shoulder and slapped her on the face. She also stated that Micky Yoochun was watching the scene take place while laughing. figure out what had happened. Many posts rebutting the original post, with titles such as ‘The explanation from the restaurant manager’ and ‘Post written by a fansite master after talking with Yoochun’s manager’, have spread very quickly. The original poster has currently deleted all her posts in the site saying, “This case isn’t something that should be fought over in here and made a fuss about, it’s a problem that should be settled by the police. On the other hand, Micky Yoochun’s manager stated that he pushed the girl’s shoulder but he never slapped her. TVXQ’s Micky Yoochun has been caught in an assault case. A netizen stated in an online forum on the 26th that her sister was assaulted by Micky Yoochun’s manager. Micky Yoochun, when his manager swore at and slapped her sister. She also added that the CCTV footage has been attained and she has no thought of coming to a settlement. ‘Korean music and drama has become a remedy for young people in Romania, who are suffering greatly as a result of economic depression. Koreans should be proud of their music and their television dramas.’ said the president of Romania’s ‘Loving Korea’ fan club, Diana Voina. Some of the most popular and established fan cafes in Romania include ‘Mirotic Cristal Romania’, ‘Primadonna Romania’ and ‘ELF Romania’ etc.